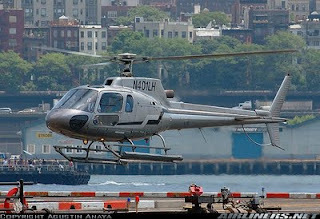 8 August 2009; Eurocopter and Piper Saratoga, Hudson River, near New York City: A single-engine aircraft and a sightseeing helicopter collided at about noon over the Hudson River near Manhattan. Three people were aboard the single-engine Piper PA-32R-300 (N71MC), and the flight plan indicated the aircraft was heading from Teterboro Airport in Teaneck, New Jersey to Ocean City, New Jersey. The Saratoga took off from Teterboro shortly before noon local time. On board were a pilot and two passengers, including one teenager. 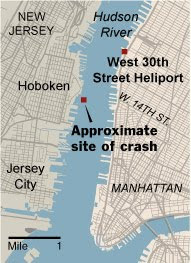 The Liberty Harbor Sightseeing Tours helicopter, a Eurocopter AS350 (N401LH), took off from Pier 30 in Manhattan, near West 30th Street, and reportedly had one pilot and five Italian tourists on board. Two of those tourists were also teenagers. According to eyewitnesses, the collision occurred over the Hudson, in the area between the Lincoln and Holland tunnels. The right wing was sheared off the Cherokee, and it corkscrewed into the Hudson. The helicopter was also seen falling into the Hudson, shedding debris, including helicopter blades on the way down. Some of the debris landed in Hoboken, New Jersey. Both aircraft sank immediately after hitting the water near the New Jersey side of the Hudson near Hoboken. This is an area east of where West 14th Street in Manhattan meets the Hudson. One body was found floating in the river, and several others were found in a piece of wreckage. No survivors have been found from either aircraft. The National Transportation Safety Board has dispatched a Go Team to investigate the midair collision. This tradegy could have been avoided with some new technology from Aviation Safety Resources. In this scenario the SRS system would have sensed the loss of a wing or control surface and automatically deployed the appropriate safety devices - parachutes etc. The system on the Piper would have recognized the loss of the wing (a control surface). It would have known how close to the ground/water the aircraft was. 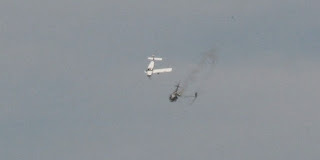 It then would have immediately separated the other wing and immediately followed with parachute system deployment. 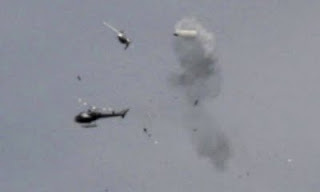 The aircraft center section, with all passengers, would have been under parachute in a matter of 4 to 5 seconds. It would have landed softly on the water. Passengers would have opened the door and climbed out. With the helicopter, the SRS would have recognized the rotor separation or loss of control, separated the rotor blades if they were still attached and then deployed the parachute system in the same way as the airplane above. These people could have survived. True TaraJeanASR, something was amiss in this situation and as result there were some lives lost.